Considered as a family drink and used to accompany food such as lunch or dinner, sangria has a large number of followers in Spain, the rest of Europe and Latin America. It’s a drink that is part of the Spanish character. You may wonder why it is so popular in our country? Because sangria is a drink of sun and summer - that’s why! It is what sets the tone in small gatherings at home in Spain, during those hot months at that time of the year. It is said that the Autonomous Community of Castile-La Mancha is the region where most sangria is produced. Nevertheless, this drink did not exactly originate in this area. At this point, its origin remains somewhat confused. To begin with, you should know that spiced wine was one of the most consumed drinks in Europe from antiquity, because it was safer to drink than water, as this was not potable. Another theory places sangria’s origins in the Antilles when it was a British colony. Even the main expression comes from the English word “sangaree” which was inspired in its turn by the Spanish “sangre” because of the characteristic colour given by the red wine. This was how sangria, which was called “wine lemonade” in some Spanish colonies in America, reclaimed its linguistic origins by expanding its consumption in Spain after 1850. 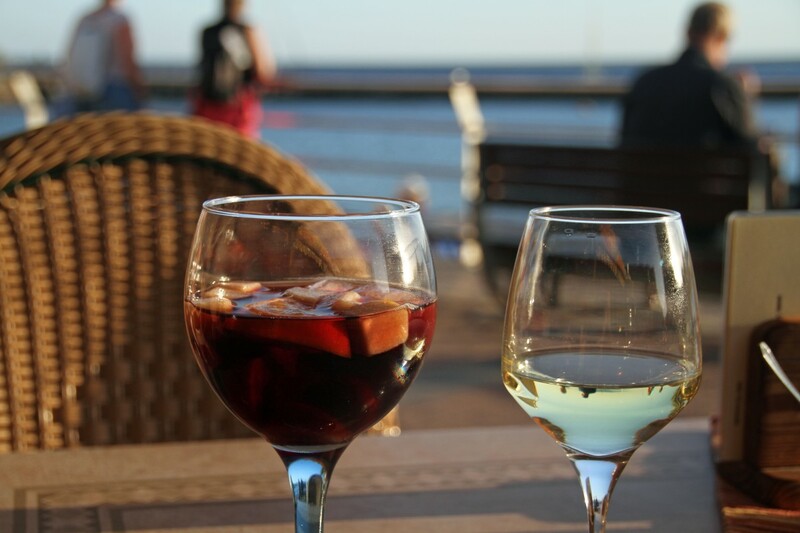 But, it was not until the Francoist period (1936-1975) that sangria became popular in Spain, especially in the 1960s with the imminent arrival of tourists. Its consumption caught on so much that its recipe was established in a law in 1970, which stated that it is a “drink made of wine and still or sparkling water with juices, natural citrus fruit essences, with or without sugar. Currently, sangria is drunk in many countries, nevertheless, it cannot be called this anywhere other than Portugal and Spain, due to an agreement established by the European Parliament, which indicates that this expression should only be used in these countries, otherwise it should be called “a flavoured wine-based drink”, which must be followed by the country of origin. The RAE (Royal Spanish Academy) defines sangria as a cold drink made with water, wine, sugar, lemon and other additions. 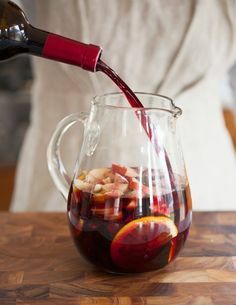 Sangria is very easy to prepare and the only difficulty is in the fact that the fruit should macerate for a couple of hours so that the drink has a definite taste of fresh fruit, but this should not exceed more than 3 hours. So far, three types of sangria are well-known: one made with red wine, one made with white or sparkling wine, also known as white sangria, and Zurra (or Zurracapote) originally from northern Spain and made with red wine, peaches, apricots and nectarines. The simplest recipe only involves wine, squeezed oranges or lemon juice, peaches or apple slices, sugar, lemonade, rum or brandy (these last three ingredients are optional). And of course, lots of ice because it is a drink served cold. It should be served in a clear jug, so that you can see the fruit: and this should have a neck of the sort that allows you to place a long ladle in to stir the contents and prevent damage. And knowing this, sangria is one of the drinks that you should try if you are not Spanish and decide to take a trip in the hot summer months. Do not hesitate to ask the locals for the best Sangria in town!